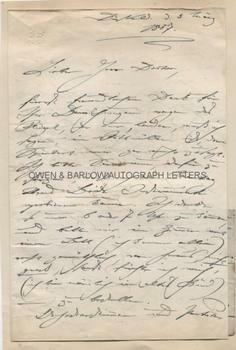 CLARA SCHUMANN Autograph Letter Signed. German musician and composer. Wife of Robert Schumann. Nee Clara Josephine Wieck. ALS, 3pp on notepaper embossed with the monogram of Clara Schumann, together with original envelope. Dusseldorf. 5th March 1857. 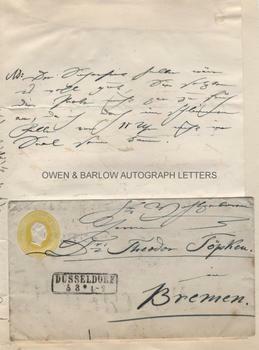 To Dr Theodor Topken at Bremen. 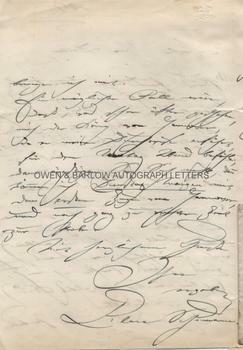 Text of the letter is in German and, due to the somewhat florid style of Clara Schumann's handwriting, we have only succeeded in a partial translation. Clara Schumann writes to Theodor Topken thanking him for his suggestion or recommendation concerning a piano. She says that, sadly she does not like this and gives her reasons for this. She goes on to say that she would like Topken to arrange a meeting on Monday evening. The meeting is apparently for a rehearsal with someone whose name we have been unable to read but whose Christian name is possibly Erik. She tells Topken "I was thinking about arriving about 6 or 7 o'clock, and would like to ask you to get me a room with a comfy bed (I come alone) . . . Otherwise I'll be afraid (because I'm an old child really)". She says that she will bring music with her. She makes the proviso that "it is possible, as has happened often in the past, that the King of Hannover will ask me to [guest-conduct?] on Monday evening. In that case don't worry. I will arrive by train from Hannover on Tuesday morning, right on time for the rehearsal." She adds a post-script "it would be good if you would not schedule the rehearsal too early in the morning, as I, in the worst case, won't be able to make it to the hall before 10 o'clock." 8vo. Approx 8.5 x 5.5 inches. Laid down by the blank verso of last leaf to part of an old album page and with the original envelope pasted to the letter below the post-script. Very slight age discolouration to edges, else fine. Clara Schumann is regarded as the greatest of the romantic era pianists and was, possibly, one of the greatest pianists of all time. She was also a fine composer and her stature in this field had increased considerably since her death. She was a friend and encourager of Johannes Brahms and was the first to perform some of his works. Her husband Robert Schumann had died in a mental institution less than 8 months before the date of this letter. Clara Schumann had spent Christmas 1856 with Brahms and her four youngest children in Dusseldorf. She then went to Leipzig where she stayed with her two eldest daughters and played at the New Year concert. Clara Schumann returned to Dusseldorf in January and in February 1857 gave concerts with Brahms and Joachim in Hanover and Gottingen. On February 28th, she took part in a memorial concert for her husband, Robert, and then in March travelled to Bremen for the first leg of a short concert tour of German cities. It is rehearsals for this concert in Bremen that she refers to in this letter. Theodor Topken (1807-1880) was an old friend of Robert Schumann from his Heidelberg days. He was a doctor of law and a very talented amateur musician who Robert had encouraged and the two often played duets together. He remained a close friend and confidante of the family and both Robert and Clara Schumann corresponded frequently with him.